I first visited Eric’s this summer, soon after moving to Huddersfield. It was late on a Friday night, and I was in need of some hearty food. I ate my way through glorious spinach and ricotta tortellini, with a rather beautiful lovage pesto as well as devouring the bread and oil we were served to start. I left with a belly full of food and feeling rather quite excited about my next visit. As I exited I placed a flyer in my handbag for the neighbouring PAX Burger – just down the road. Both Eric's, and PAX were owned by the same chef – Eric Paxman. 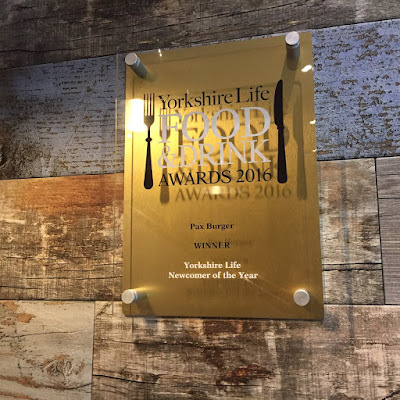 When the Yorkshire Life awards were announced this September, PAX won Newcomer of the Year, which instantly reignited the intrigue and desire to visit. I was, you could say rather excited about this, and when I arrived at PAX I was cold, wet and rather depressed about the dreary wet autumn weather. But, instantly I felt transported into another world, I could have so easily been in Soho, New York, even Reykjavik. The vibe was electric, two girls chatting over milkshakes, I remember thinking gosh, what a cool place to be! I quickly glanced over to the bar, full of amazing quirks before being led upstairs to dine. The layout has a very similar feel to that of Eric’s, almost as if you are dining in someone’s house. It’s very intimate, yes, a burger bar intimate. I plunged straight into the menu, and beamed as I saw food that was full of real flavour and thought, the specials board equally delighted. My god, I was spoilt for choice. When ordering, I felt particularly looked after – as the young waitress was as accommodating as that of a fine-dining restaurant. 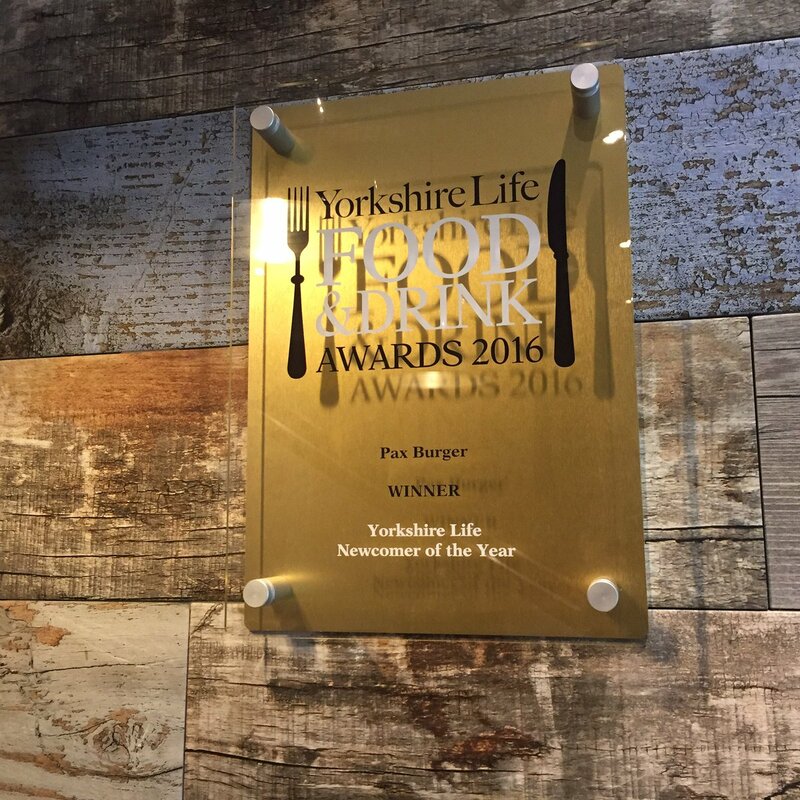 The fact our food was ‘messy food’ and came served on a tray didn’t matter. Service, no matter what you are ordering is essential to gaining good reputation. Once I’d ordered, I started to admire the interior. Now, there was no denying that this restaurant was clean and modern. But, on closer inspection it was not just fitted for purpose, there was real thought and passion spread around each corner. From the vibrant pops of yellow, even in the light fittings, to the striking blue back drop to the denim uniforms. My ‘Licky Lips’ chicken burger was supreme – the kimchi slaw got me all excited and the brioche was particularly good. I left feeling full to bursting. A few nights later I was reflecting on PAX, and it suddenly hit me why I had loved it so much. Because, guess what - it was different. It was doing things SO differently. I guess what makes it special for me is, working in the food industry I see so many examples of how we should enjoy food, what we should be eating, where we should be eating etc., that when you see someone doing it their own way, and doing it spectacularly well – it’s a breath of a fresh air. 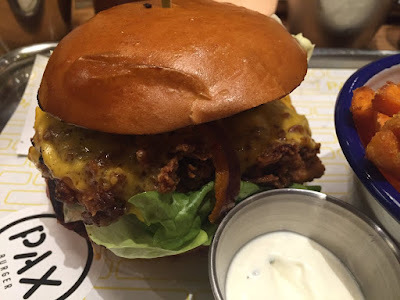 To find a gourmet burger restaurant on my doorstep, serving up quality food, in a friendly and accommodating style, well it just sums it up perfectly really.